From Three Little Kittens, illustrated by Lilian Oblgado © 1974 by Random House, Inc. When our boys were little, they loved to read books. Well, they loved to have us read books to them anyway. One of our favorites was a beautifully illustrated version of “The Three Little Kittens.” One of the kittens in this story wore a green plaid coat. This was the kitten who was never happy. Arms crossed, brow furrowed, the kitten in the green plaid coat looked stubborn and rebellious. 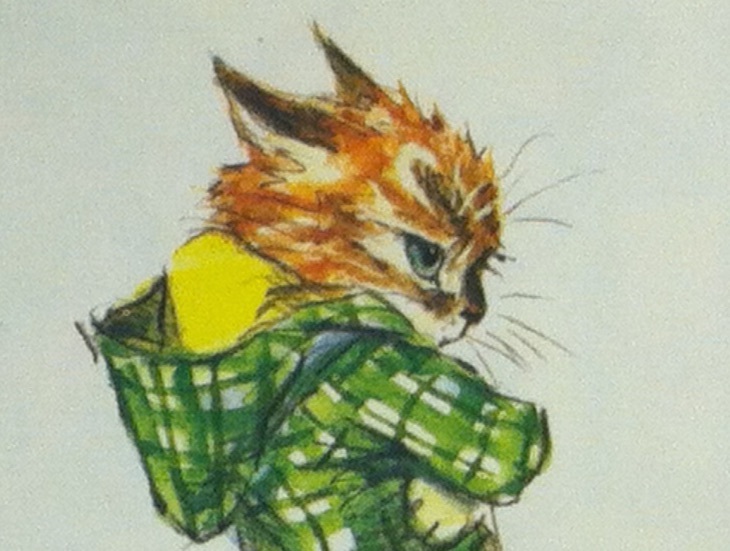 Whenever one of our boys started to pout about something, we’d tell him, “you look like the kitten in the green plaid coat” and he’d know exactly what we meant. 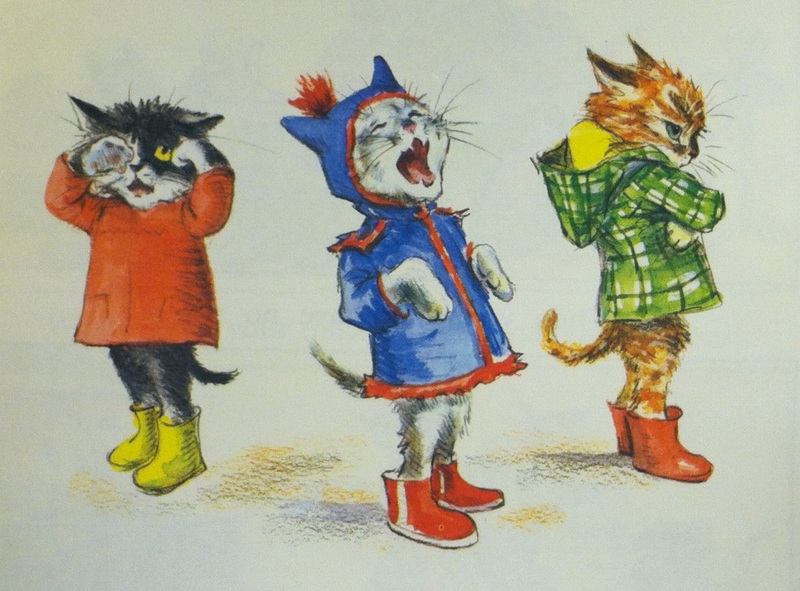 I think, at some point or another in our lives, each of us might be the kitten in the green plaid coat. We rebel a little bit when we don’t get what we want. We pout. We cross our arms and frown, and refuse to be happy. We resist the rules. We dislike authority. That’s why we have trouble with the Ten Commandments. We see God’s rule for life as too restrictive. But God didn’t put these words into place to keep us from being happy. God has something else in mind for each of us. God’s plan is to be with us, to live life with us. The Big Idea of the whole Bible is God’s declaration, “I want to come down and dwell with you. I want to live among the people I created specifically for that purpose.” Even though humans messed up that plan at the very beginning, God is still working to make it happen. Through Abraham’s sons, God raised up a nation to show the world how to live with God. As God led the children of Israel out of slavery in Egypt, he used his servant Moses to teach them God’s ways. Bit by bit, God revealed his plan for living among the people of Israel. That plan included land, law, and lordship, or “The three Ts: Terra, Torah, and Temple.” God offered his people a place to live, a rule for living, and a way to worship. The land had been promised to Abraham centuries before. But the children of Israel were not ready yet to receive that land. In the meantime, as they wandered in the wilderness, God went with them in the pillar of cloud by day and fire by night. Wherever the pillar went, the people followed. Whenever the pillar stopped, the people stopped. The pillar identified wherever they were as the place they were supposed to be. It showed the people that God was present with them. But it also obscured their vision. They could not look at God in their sinful state and live. The cloud and flame prevented sinful humans from seeing God, at the same time it confirmed God’s presence among them. In order for God to remain with people, the people had to change the way they behaved toward God and toward one another. God wants people to live in loving relationship that shows the world who God is. So he gave us the Ten Words to guide our behavior toward God and toward each other. In Jewish tradition, this passage is not called “The Ten Commandments.” It’s called “The Ten Words” or “The Ten Teachings.” “Teachings” doesn’t sound nearly as strong as “Commandments” to our ears. It just doesn’t have that same imperative ring. Yet these words form the cornerstone of Torah, or teachings of God for his chosen people. Maybe we have come to think of these ten sayings as “commandments” because God presents these words in covenant language, and covenant language is legal language. So we think of the Ten Commandments as God’s Law. Certainly, by the time Jesus began his ministry, these saying were considered to be Law. They were written in the same form as a treaty between an overlord and a vassal, or a stronger nation and a weaker one. When a treaty like this describes a situation in which one powerful nation controls the foreign affairs of a dependent one, that dependent nation is allowed to govern its own internal affairs as long as it remains loyal to the stronger nation. In exchange for this loyalty, the more powerful country agrees to protect the weaker nation from invaders. Choose life. God’s commands are words to live by. Love God. Love neighbor. The first four Commandments are all about how to love God, and the last six are all about how to love each other. As United Methodists, we draw on the wisdom and theology of John Wesley, who developed three general rules for discipleship. These “three simple rules” also reflect Christ’s command to love God, and love our neighbor. Growing deeper in love of God and neighbor may be all God had in mind, when he used the tip of his finger to spell out for Moses and the children of Israel this covenant of relationship in ten simple teachings. The Gospel Imperatives adopted by the Minnesota Conference reflect this desire for loving relationship, as we seek to grow in our love for God and others, reach new people, and heal a broken world. It’s important to remember that the commandments about loving God come first. The commandments about loving each other come second. Jesus identified the first and greatest commandment as loving God, and the second as loving neighbor. Our love for others grows out of our love for God. But we have to love God first. As we dive into becoming more healthy and missional through the Healthy Church Initiative process, I keep thinking about ways we can re-focus our attention outward toward our neighbors, while we grow deeper in faith and our love of God. One of the things that keeps grabbing my attention is the way we use language in the church. It is so easy to fall into “church-speak” and use words that wouldn’t come up in our conversations outside these walls. Even the mission statement of the United Methodist Church does this: We “make disciples of Jesus Christ for the transformation of the world.” Well, what is a disciple, exactly? And what’s transformation all about, anyway? How do you explain this mission to someone who has never experienced church? Take the word, “disciple.” In order to make disciples, we have to be disciples, but that’s hard to do if we don’t really know what a disciple is. A disciples is a student, someone who walks in the footsteps of a teacher, trying to be as much like that teacher as possible, a follower. And what about that word, transformation? Isn’t it just a fancy word for complete change? What if we started talking about following Jesus to change the world? That’s a pretty amazing goal, when you think about it. Changing the world is a huge task. It’s one we can’t possibly complete, unless we are following Jesus, walking in his footsteps, trying to be as much like Jesus as we can possibly be. words that are a pathway pointing to peace. and we have these words, and our heart for their home. God wants to live among us. In the wilderness, he had the Israelites construct a tabernacle where his presence could remain in the midst of his people. Later, King Solomon would build a temple in Jerusalem to replace the tabernacle. Eventually, both the tabernacle and the temple would be destroyed, but God still wants to live among us. And for that to happen, God requires one thing more than a place to live and rules to live by. God requires atonement for sin by the shedding of blood. Atonement is simply being made “at one” with God. The sin nature is the main thing that keeps us separated from God. Each one of us has a sin nature. At some point in our lives, we each are the kitten in the green plaid coat. The only way to overcome our sinfulness is through sacrifice. Jesus gave himself as that sacrifice for us, and his blood once and for all covers our sin (Hebrews 10:1-18), making us “at one” with God. With the blood of Jesus on the doorframe of your life, you are forgiven and given direct access into God’s presence. “By this everyone will know that you are my disciples, my followers,” Jesus says. That’s our job: follow Jesus to change the world. Let’s pray. Lord Jesus, it’s so easy to get stuck in the rule book and forget the reason behind the rules, that you want us to love you and love each other. As we do that, the world sees what love is supposed to look like. Help us to keep churching to change the world, so that, bit by bit, person by person, your Kingdom can become a reality for all people everywhere. Start by changing us, O Lord. Help us to follow you so closely that we become covered in the dust you kick up ahead of us. We pray these things in your holy name, Amen. 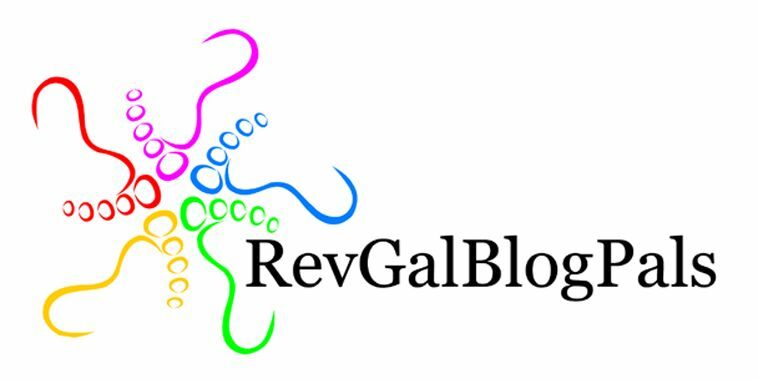 This entry was posted in Sermons, The Story and tagged Love God, love neighbor, Ten Commandments, The Story 5 on October 10, 2015 by pastorsings. Thanks for sharing! I’d never heard the “Three T’s” before!